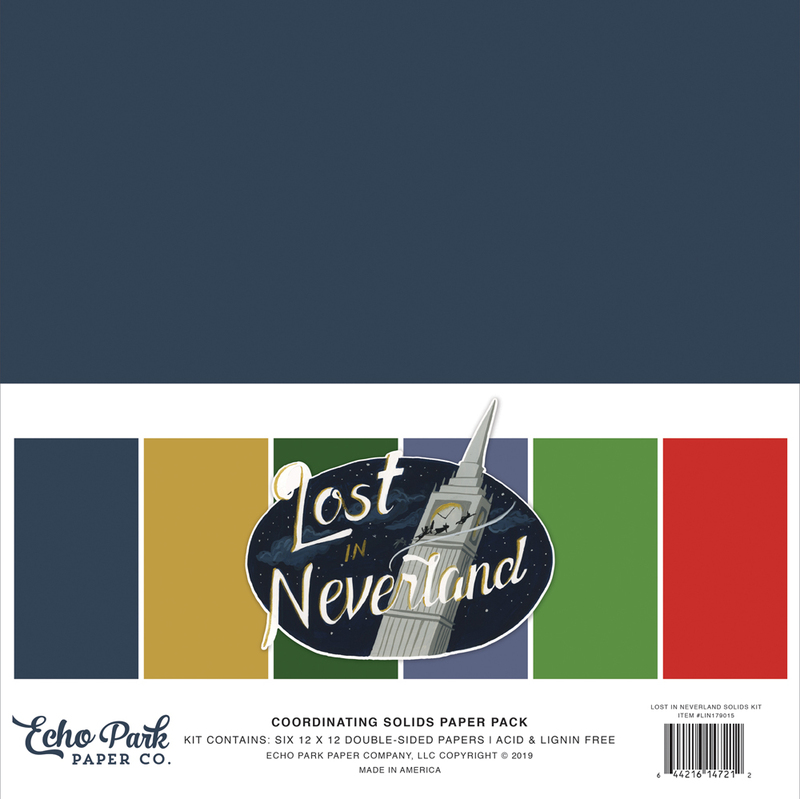 With crocodiles, pirates and fairies that fly, the Echo Park Paper's Lost in Neverland Collection has something to delight everyone. Michelle Zerull here today to whisk you off to Tinkerbell's Magical Hideaway. Tinkerbell's Magical Hideaway is three paper structures that consist of a paper toadstool, a hanging flower lamp made from paper, and a paper miniature fairy cottage. Everything was created with my electronic cutting machine along with papers and embellishments from Echo Park Paper. The fairy cottage is made entirely from paper. I used Carta Bella Natural White Linen Designer Cardstock for the body of the cottage. Covering panels were made from the “B” side of 4x4 Journaling Cards Paper. That print was the inspiration for the entire project. It looks like it belongs in a storybook forest! Carta Bella Ebony Black Felt Designer Cardstock was used for the roof structure. The roof's covering panels consists of the “B” side of 3x4 Journaling Cards patterned paper. I love that green print! In fact, I love all of the prints and patterns. The illustrations are lovely works of art! Do you see Tinkerbell flying out of the door? The Tinkerbell Die Set captured her playful spirit. She was easy to put together, and seems right at home! The toadstool and flower lamp were extras that I made to help bring the Magical Hideaway to life. For these projects, I used several papers from the Solids Kit. The Solid Kits play an integral part in my crafting. I love knowing that the colors match the collections perfectly each and every time. No guesswork needed! I like to think of the solids as “supporting actors”. They don't take center stage, but they add cohesiveness and help tie everything all together. My flower lamp is actually two projects combined into one. The base is a wreath stand with the arm turned upside down. The flower is actually an upside-down Tulip. I added a few extra long stamen to give it a fantasy makeover. Everyone needs a little bit of magic. You don't need pixie dust, to find your next adventure, but you do need Lost in Neverland! Hiya scrappy peeps! Suzanna here today to share with you a layout created with the adorable “Lost in Neverland” collection using a couple of throw back photos! Nikolas, my now 16 year old son, was 5 in these pictures! And about 5 feet shorter than he is presently. LOL! Time slow down! I can just hear the ticking of the alligators watch tick tocking! I wouldn’t say I’m a “mixed media gal” per se but I do love texture on my page and one of the best ways to start a page is a little something of the mixed media variety. 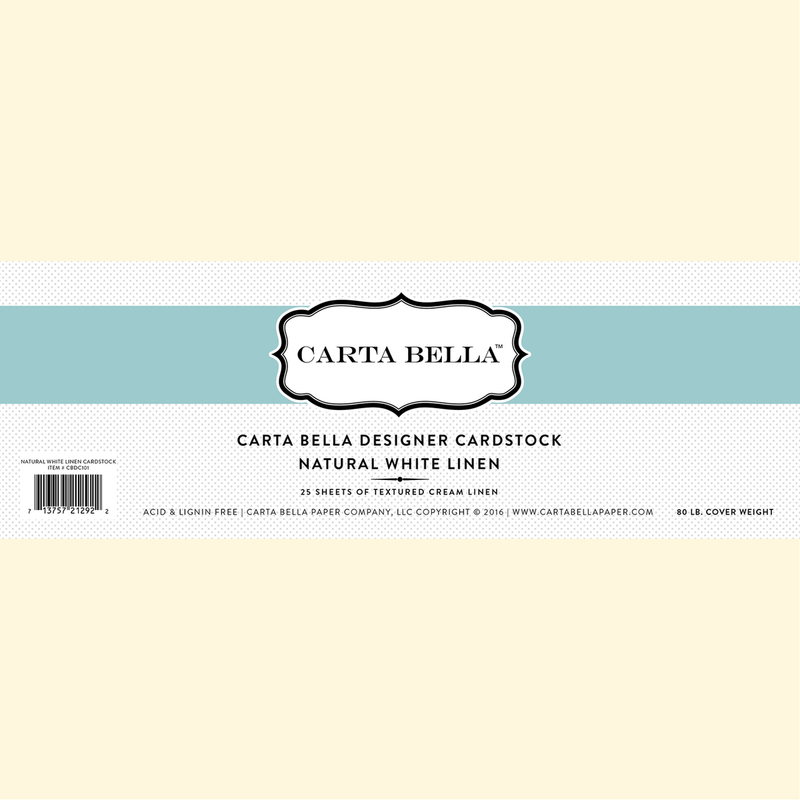 The stencils that accompany Carta Bella collections always tug at my heart strings and say “Me! You need me, take me home!” and I’m happy to oblige! This page began with the London Sky stencil and some modeling paste. I struggled between a white cardstock and the “Straight On Til Morning” patterned paper with the night sky. As my pictures are already pretty dark (back before I really knew how to take photos without a flash and out of Auto mode), I went with the white. There are so many wonderfully rich colors in this collection! There is a mix of both 12x12 patterned papers and some from the 6x6 paper pad. The beauty of having both is that you can chose the size pattern you want to add a tad more variety to your page or pages. Layers upon layers of eye candy behind and around the photos abound on this page. These really aren’t great photos as so I really tried to distract you with the product! LOL! Sometimes it’s just as much about your creative process as it is the story you’re sharing, don’t you think? The enamel dots that accompany the collection and the teeny little Tinkerbells are perfect to scatter around the page for added color and visual interest to this Lost in Neverland page! Be sure to swing by my YouTube channel and check out the process video if you are interested! Thanks for stopping in to today! I look forward to seeing you again soon! Faith, trust, and pixie dust! 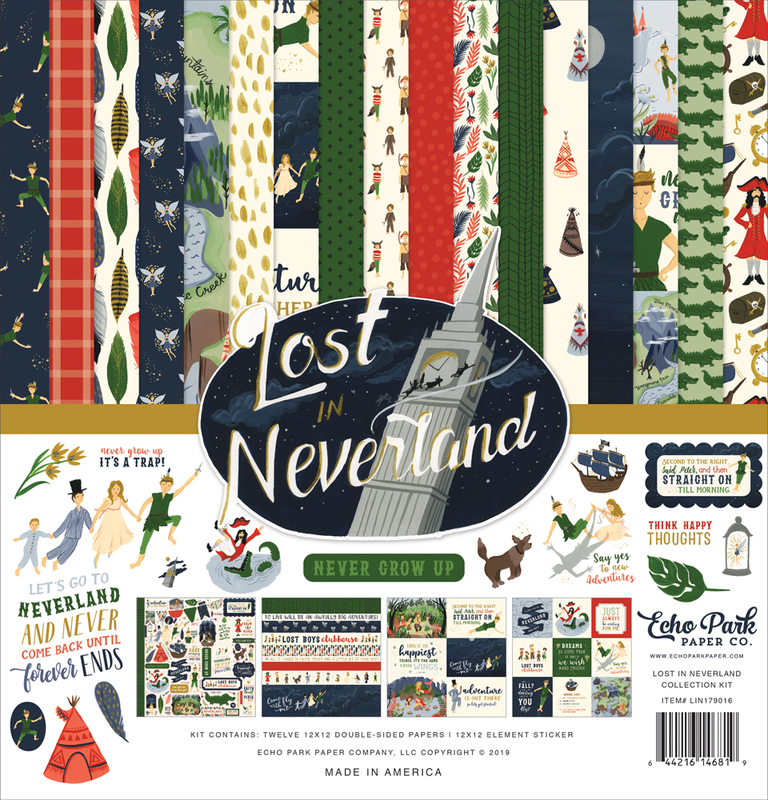 Set out on a card making adventure with the Lost In Neverland collection! I sat at my desk to play with this collection and couldn’t stop. I have six “Darling” cards to share with you today. Tinkerbell, herself, is here to take you on your magical journey! I cut her out using the Tinkerbell die set with shimmer cardstocks by Carta Bella Paper. I doubled up her vellum wings to allow her to flutter about. The Peter Pan Ephemera tag is captain of the Jolly Roger on this card. Just use your imagination and think happy thoughts and you will be on your way to dreamland! For this card I created a waterfall of circles with a scene. I love how you can almost follow the story line as you follow each picture from top to bottom. I anchored the Lost Boy sticker, along with the teepee, on a series of concentric punched circles for a simple, yet striking design. A sprinkling of enamel dots adds dimension and shine. I used the Hello Baby Boy Shining Stars embossing folder to emboss a night sky on Navy Shimmer cardstock for the background of this card. I love how the Darling children are holding hands as they experience pixie dust for the first time. A tiny, chipboard Tinkerbell provides a never-ending supply of fun. I hope you enjoyed this trip to Neverland today! Thanks for coming by! The award for “Best Summer Ever” goes to... Best Summer Ever 2019! It has been a cold, miserable Winter and we deserve a little fun in the sun. 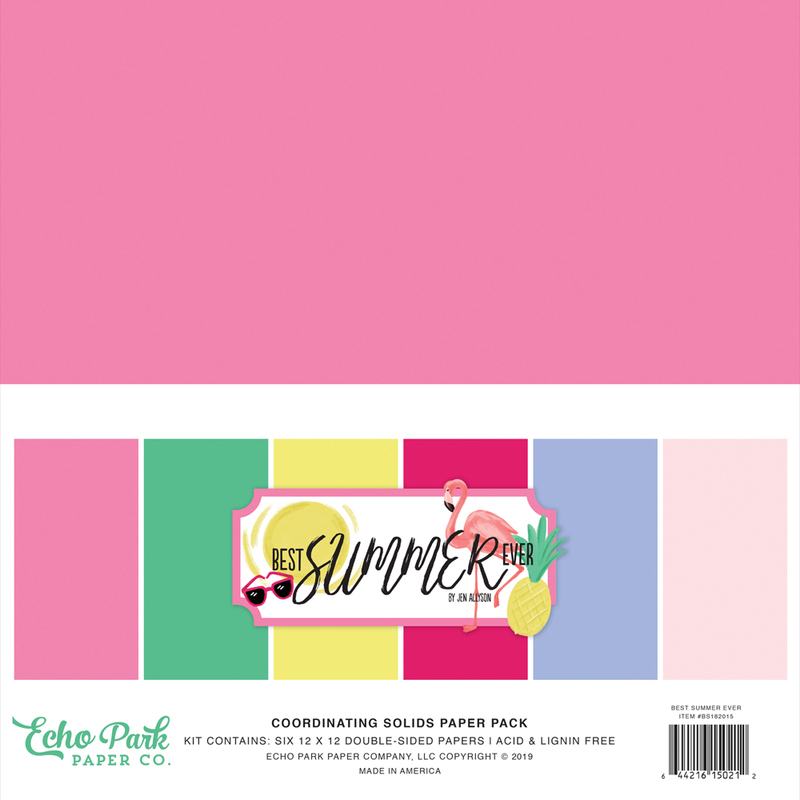 Pack up those parkas and get ready to dive into playful patterns, trendy images and sizzling hot colors with the Echo Park Paper Best Summer Ever Collection. The name of the collection inspired me to create some whimsical Summertime trophies. Who wouldn't want a trophy that says, “Fun” or “Relax?” I would! And with Mother's Day around the corner, I know lots of other Moms (and Dads!) who would too! I made three trophies for this project, but one or two would be awesome. There are so many great sentiments in the Best Summer Ever Ephemera pack, that you'll be inspired to make an entire trophy case full! The pieces were cut with my electronic cutting machine and they all assembled easily. They were so simple to put together that you could craft with an older child and have them help with assembly. Food trucks, swimming pools and citrus treats are all images that the entire family can relate to. I focused my project on the citrus treats. The pineapple in the Sweet Treats Die Set is adorable! Let's make 2019 the Best Summer Ever! Good morning Echo Park friends! Anya here today and I would like to share a set of cards I created with the fun Animal Safari collection. These two cards are very similar, but one of them is a shaker card where the other one is just layered open window card. Both of these cards started with fussy cutting a bunch of elements two patterned papers the “Bird of Paradise” and the “Butterfly Kisses”. Instead of just one circle window, I created two layers, reducing the size of the window each time and added each layer with foam adhesive. This gave me opportunity to add greens and birds in many different layers. Hey there Echo Park fans! It's Tya up on the blog today. As an avid animal lover, I fell head over heels in love with the fun Animal Safari collection! Anytime we travel I love to visit zoos or aquariums or anything that has to do with animals. I may have even planned a few family vacations around animals lol! Anyway- I am sharing a card I made featuring the Animal Safari collection today. To make this card I used a 4 1/4 x 5 1/2 inch piece of white cardstock as my base. The blue, zebra and yellow pattern papers are from the 6x6 paper pad. I love using the smaller scale of the 6x6 paper pads for card making! I decided to do a little watercolor painting on this card. I cut a piece of watercolor paper to 3 1/2 x 5 inches. I ripped the edges of the paper for some added texture. I added some yellow, orange and tan paint and splatters to the watercolor paper. I really liked the pop of color it added to the card. To decorate the card, I added the Zooventure label sticker to the card with foam tape. I used my Silhouette Cameo to cut out 3 leaf shapes (found here) out of some Green Coordinating Solid paper. I glued them back behind the label sticker. I also added a small butterfly and "happy" word sticker from the Element Sticker sheet. I loved this beautiful macaw bird that I fussy cut from the Birds of Paradise paper. I added the bird to the top right of the sticker label. I also added a few loops of brown twine behind the label sticker as well for some texture. This card was so much fun to make and had me wanting to take another animal-themed adventure soon. I hope I have inspired you to make a few cards with this stunning collection. It has so many possibilities! Happy Crafting! Head to the park; it's baseball season! Cheer on your little slugger with treat bags made from the new Carta Bella Baseball Collection by Steven Duncan. There are so many awesome papers in this line, that you'll be able to craft enough bags for the entire team! I love the “Hey Batter Batter” patterned paper. The fun graphics really capture the spirit of the big league games. The Element Sticker Sheet is loaded with sporty images to decorate with. I love being able to layer them on this “Play Ball” treat bag. 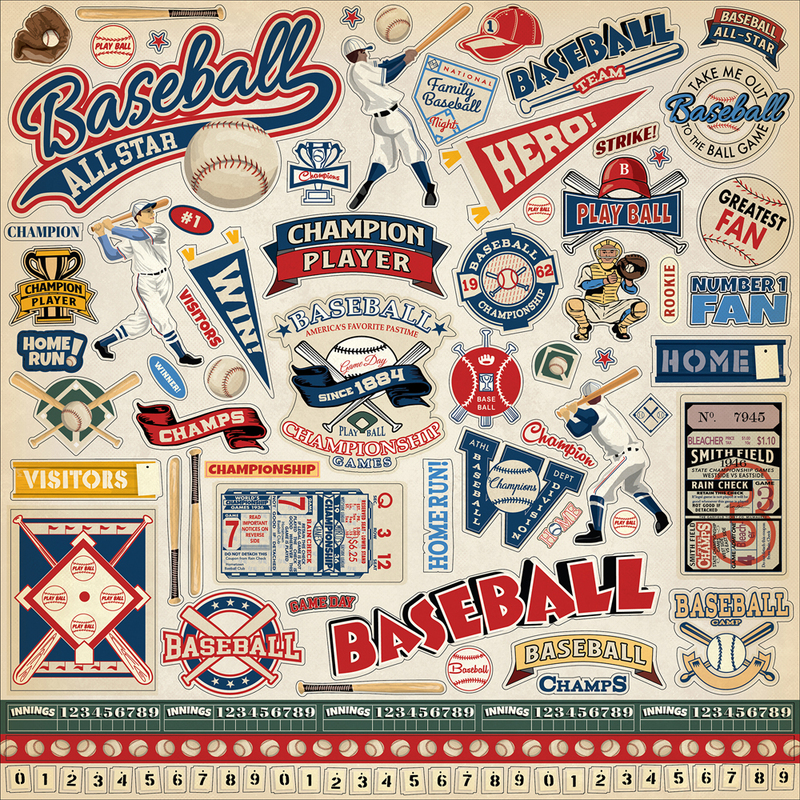 You can use your stickers along with the Baseball Ephemera Pack to achieve some really playful looks. The “Baseball Thread” paper is one of my favorites. It looks so real! 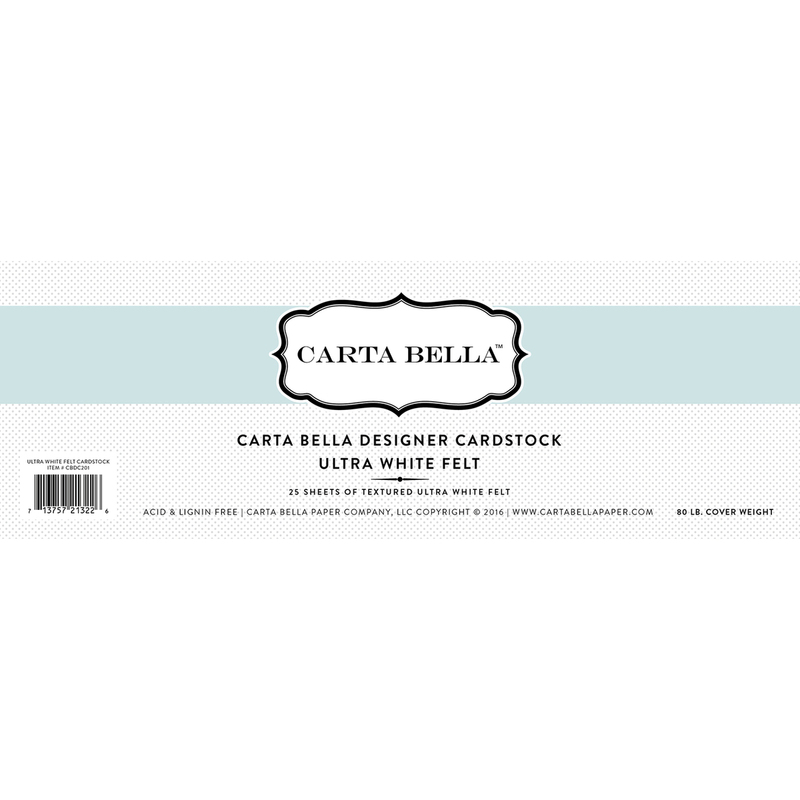 Did you know that there are Carta Bella and Echo Park Paper images at the Silhouette Design Store? I used the Carta Bella Decorative Rounded Flap Bag SVG, along with my Silhouette Cameo, to make these dimensional bags. The small size is perfect for your little shortstop, but you can enlarge it to cut a king-size bag for the coach. It doesn't matter if you're a big league fan or a T-Ball Mom, baseball is a Summer activity we can all enjoy. This year, enjoy it with Carta Bella Baseball. Hiya scrappy peeps! Suzanna here today to share with you a double page layout I created using the Baseball collection! Both kids were born in the Chicagoland area and were raised as Cubs fans! On our drive back to Richmond from Toronto this summer, we made a slight detour to Philly to see the Cubs play. This collection is perfect not only for your baseball player but for a great night or afternoon spectating at the ballpark and cheering on your favorite team! This layout afforded me the ability to share 5 photos and include a decent amount of journaling! There is a single 4x6 vertical photo and four 4x3 horizontal photos. By including all the strips, from both the strips patterned paper as well as strips I cut from various patterned papers in the collection, I was able to incorporate into this double page spread. The 6x6 paper pads are a perfect compliment to the collection as they usually include some coordinating solids to the collection such as this red that I used to cut out a batter to punctuate the white space to the left of the photos. The cardstock “Champions” continued the line begun with the back leg of the batter and leads your eye up to the photo. While not proportional, this cluster of stickers, chipboard and ephemera really do the layout justice by subtitling the layout and adding more visual interest to the page. I also used stamps from one of the two accompanying stamp sets to add a bit more to the bottom of the striped rows moving across the page. I could have cut another strip to layer in but I liked the complimentary colors from the stamping and subtle white space that afforded at the bottom of the main part of the layout. This was a low scoring game and I was pleased to be able to include the actual score with a combination of the chipboard stickers and Element stickers. BTW, be forewarned that if you’re going to make faces in my photos, I’m going to scrap them! LOL! Yo Ho Ho! Ahoy crafty friends. Welcome aboard! Michelle Zerull with you today to share my Echo Park Paper “Pirate Tales” Pirate Ship! I loved creating my Galleon with these fun papers. The whimsical prints and patterns will please any pirate! 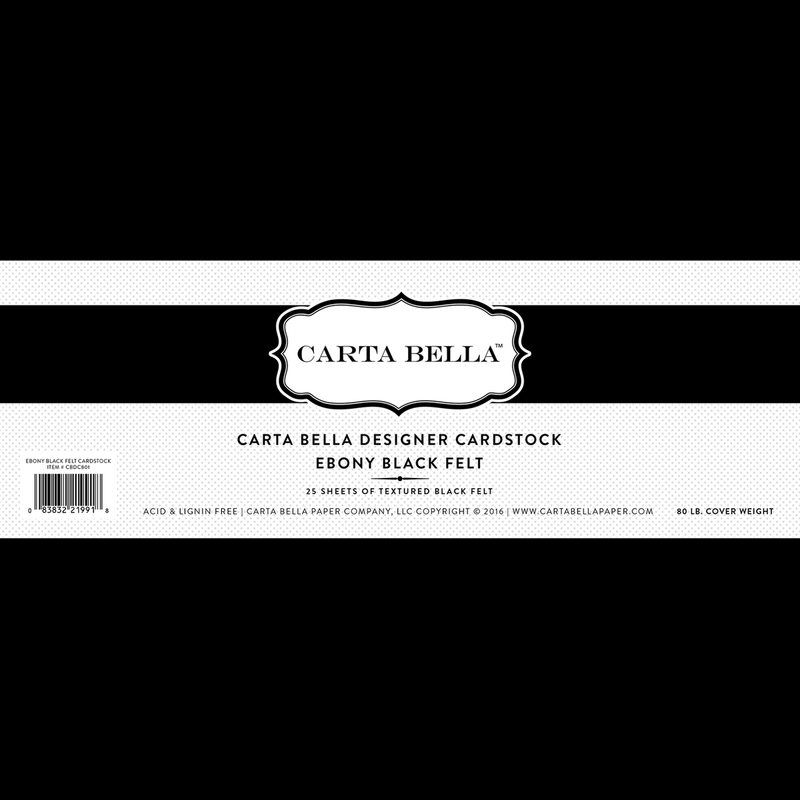 The ship's hull is constructed with Carta Bella Ebony Black Felt Cardstock. I love this cardstock for creating structures. It has a felt-like texture that grabs glue fast. It's durable, yet is so easy to cut with my Silhouette Cameo. It's my favorite! After creating the hull, I covered it in scales! This uniquely scaled print is the “B” side of the 3x4 Journaling Card Paper. Such a fun piece of paper! Isn't it great for making scallops? It wouldn't be a Pirate Ship without a Jolly Roger! The Skull and Crossbones Die Set fit nicely on the mast sail. It's a warning for the landlubbers to beware of the pirates, but I think that it's a sign that there's pirate cuteness ahead! I wanted my buccaneers to know that they're special, so I made a sign to declare it to everyone. The Pirate Tales Ephemera has so many fun sentiments, that it was hard to choose my favorite. Using gold paper from the Pirate Tales Solids Kit, I made a bit of my own paper treasure to bring the point home. And also because the gold doubloons will be fun to play with! An adorable map from the 6X6 Paper Pad is trimmed to fit in a small glass bottle. Every pirate loves to search for buried treasure, and X marks the spot! I really enjoyed working with the Pirate Tales line of papers and embellishments. Whether you're making for Captain Hook, or a Pirate Princess, you'll find something for every lad and lassie. Heave Ho! It's a pirate's life for me! Ahoy there, Matey! It’s Jana Eubank here today with a trio of cards created with the Pirate Tales collection. This collection is so fabulous with its variety of freebooters ready to head out on their next adventure! This first card features the Skulls & Cross Bones Die Set. I placed it on the helm fussy-cut from the 4x4 Journaling Cards. I added the “Believe” word across the bones, and then placed the “X Marks the Spot” sticker below for the sentiment. The Stitched Rectangle die cut frames the everything with a nice pop of yellow. This second card features a pirate that was fussy-cut from the 6x4 Journaling Cards paper. The bracket die cut from the Ephemera Pack makes a nice scene for the background. I added a few chipboard pieces along the bottom of the die cut and then tucked a ship (created with the Pirate Ship Die Set) behind the left edge. This last card features a young pirate (fussy-cut from the 3x4 Journaling Cards paper) dreaming about his next treasure hunt. I fussy-cut a banner from the Constellations paper to go across the top and added texture to the solid background paper using the Mermaid Scales embossing folder from the Mermaid Dreams collection. These cards were so much fun to put together! They will be perfect for giving to the boys and men in my life. Have a great day!